Lord Coulsfield, born John Taylor Cameron, became a judge in 1987 and now sits in the Second Division of the Inner House and in the Lands Valuation Appeal Court. He is a graduate of the Universities of Oxford (BA, Corpus Christi College) and Edinburgh (LLB) and was admitted to the Faculty of Advocates in 1960. From 1960 to 1964 he lectured in Public Law at Edinburgh University. He was appointed Queen’s Counsel in 1973 and served as an Advocate Depute from 1977 to 1979. 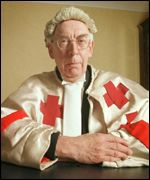 Lord Coulsfield was a Chairman of the Medical Appeals Tribunal for Scotland from 1985 to 1987 and was the Scottish judge on the Employment Appeal Tribunal from 1992 to 1996. Prior to his appointment to the Court of Session, he was a judge in the Courts of Appeal of Jersey and Guernsey. He is an editor of Scottish Law and Practice Quarterly. Lord Coulsfield chaired the committee which led to the creation of a specialised court for commercial actions and was a judge in that court from 1996 until 1998. He has also chaired a committee on procedure in actions of reparation for personal injury, which reported in 1998.